A three-year full time B. Sc. 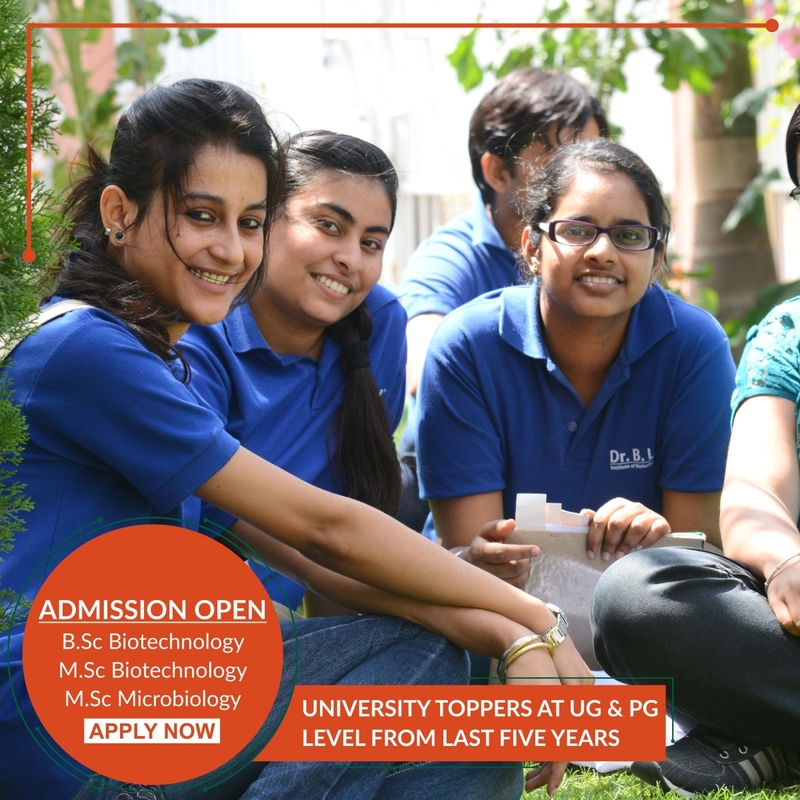 Biotechnology program is affiliated to University of Rajasthan, Jaipur and is specially designed to provide students with the skills, knowledge and experience that are needed to pursue a successful career in biotechnology. A two-year full time M. Sc. 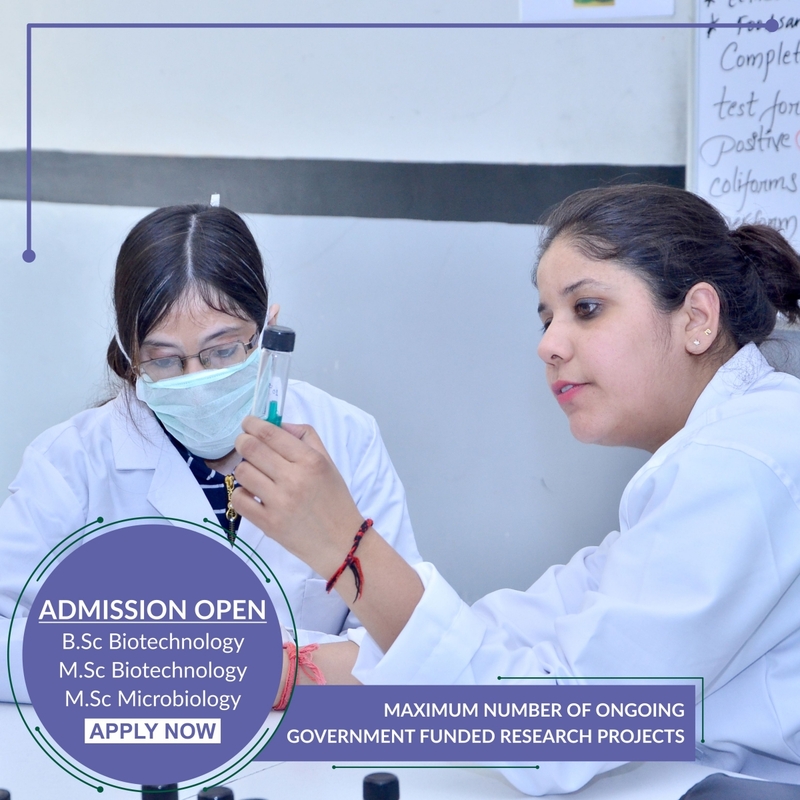 Biotechnology program is affiliated to University of Rajasthan, Jaipur and acts as a stepping stone for aspiring students willing to pursue research and employment opportunities in academia or industry.The course offers excellent learning opportunities to the students to get trained in the subject with theoretical and practical understanding of contemporary biology and biotechnology. A two-year full time M. Sc. 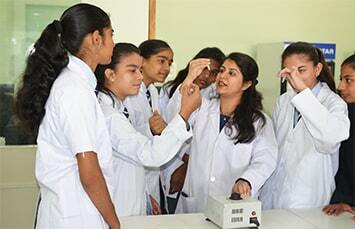 Microbiology program, affiliated to University of Rajasthan, Jaipur is designed to fulfill the requirement of the emerging industries of Microbiology. The program has been developed with an aim to produce professionals who would have sufficient knowledge and expertise to pursue inherent problems of the region. Quality Education: University topper at UG & PG level from last five years. For better placements MOUs with industries. Maximum number of ongoing Government funded research projects. Industrial biotech training to students at state and national level. Eminent scientist visit throughout the year. I really enjoyed working at Dr. B. Lal Institute of Biotechnology throughout the 2 months. The mentor I worked with is undoubtedly the best mentor I could ask for. This was my first ever research experience and I can say this with surety that it has motivated me to think of research as a career which I could pursue in the future. I have performed my dissertation with utmost dedication, passion and sincerity- few qualities I had been lacking in my life for quite some time lately. I am very thankful to BIBT for providing the IBT program which helped me prepare myself for the challenges in the industries. The faculty & staff are all dedicated to student' learning, making BIBT an exciting place to learn. 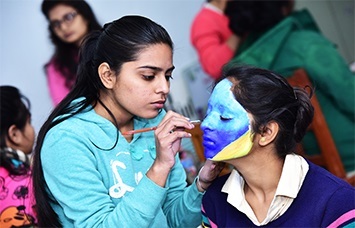 The flexible & professional environment for learning provides the opportunity to explore yourself. It was one of the best learning experiences i had. 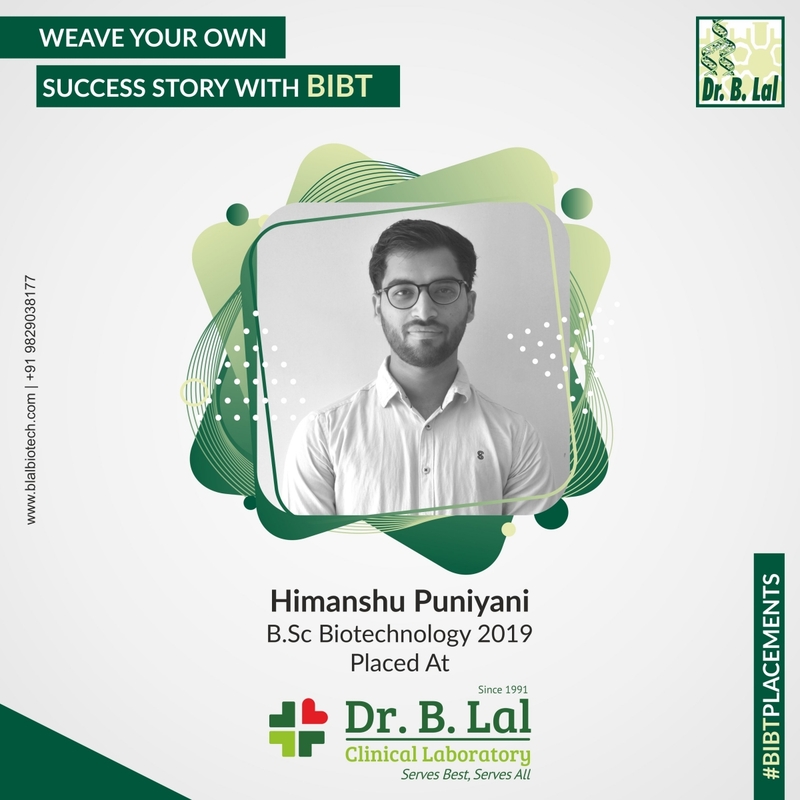 I am immensely thankful to Dr. B Lal Institute of Biotechnology for providing the summer training in the fields of Medical Microbiology and Immuno Technology which helped me to attain the practical knowledge. Faculty and staff are all dedicated to student success and innovation, and making this institute an exciting place to learn. Overall environment at this institute is very friendly and one of the best things about this institute is anytime we can go and clear our doubts. My academic life at BIBT is very interesting and exciting to build a career in biotech sector. It has excellent lab facilities and my practical knowledge is very much enhanced, also my skills are ground over here. Hi, This is Ifra Khan from MODI INSTITUTE OF MANAGEMENT AND TECHNOLOGY, Kota. 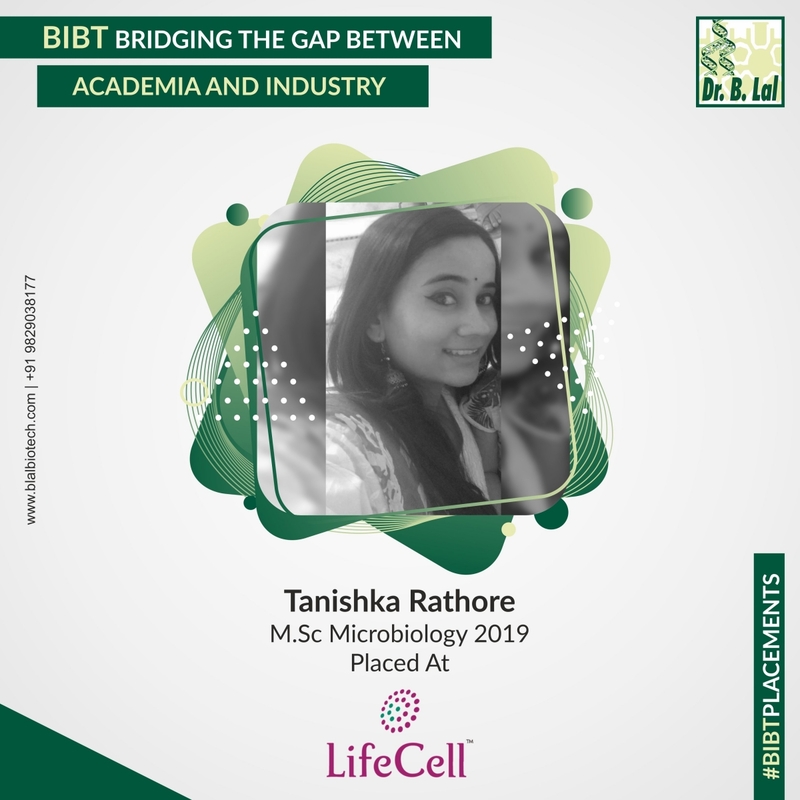 I feel very proud to share my wonderful and knowledgeable experience of training in medical microbiology from B.LAL INSTITUTE OF BIOTECHNOLOGY. I'm thankful to my mentors that they spent a lot of their precious time with us and help us to give as much as important information regarding medical microbiology. Had a great experience ...labs are good and are well equipped ... Learn so many new things, friendly environment ... Teachers or guides are too good . From June 2017 to August 2017 I was there at BIBT for my B.Sc. Biotechnology Part III dissertation. It has been a great experience overall in BIBT. They have a panel of great faculty members who have deep theoretical and practical knowledge of field. Well equipped labs of individual subjects under the biotechnology stream with all necessary equipments. Library is full of books with all needed thesis and theoretical help from teaching staff. Canteen was best place to chill out. Thanks all you guys for being a supporting step to my future.